The customer is the boss. This is what everyone hears. The focus is on creating a happy customer experience. In a working environment, rarely do you hear “family” is the reason behind work, or “wife is the boss”. The new world of getting things done is firm-centric. An employee is coached into behavior which results in a win-win for a firm and its customers. It usually results in a net loss for families; a good employee who forgets to take care of the family. Of course, star employees make end users happy. Happy end users point toward a good customer experience. The customer is a happy boss. The lynchpin of the new information economy is a good employee. People don’t get hired because of their contribution to society. It doesn’t matter if they successfully raised children, or won the ‘good neighbor’ award. Productivity is everything. What happens when productivity outweighs core values: like family, contribution to society or preservation of the environment? Is it possible to develop a new employee paradigm which is more family-centric? I’m not talking about life-balance. I’m talking about ‘family first’. 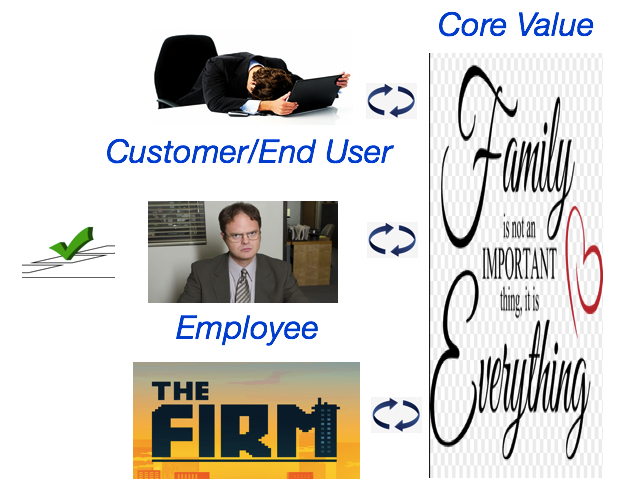 If firms can figure out how to become ‘family first’ they will become ‘first choice’ employers. Such a society existed many years ago in Japan. 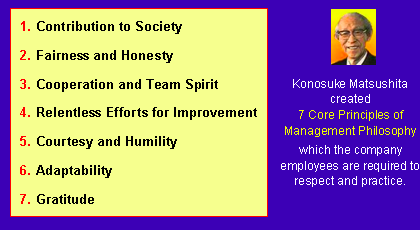 Konosuke Matsushita of Matsushita Electric Company cared deeply for the employees of his company as if they were family. Over 80 years ago, he came up with core values. Employees work long hours in Japan, but the sense of belonging is part of the sub-culture of Japanese firms. Firms take special care of families. Things don’t move that fast, however families manage to stay intact. Everything happens for a reason and is handled according to consensus. Will the emerging Employer-Employee compacts extend beyond the scope of a job, and focus on preserving families? Strong families contribute to a vibrant society.